12 months of photos following llamas, alpacas, and vicuna through the Andes Mountains of Bolivia, South America. 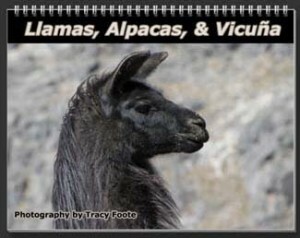 Our llama calendar is offered in several sizes and even allows customization. Personalize it to create a special gift for someone’s wall. Inside are unique photos of llamas in their natural habitat of South America. Many images come from high in the snow capped Andes mountains. When you travels to Peru, you will find the llamas in the highlands. If you see one at lower altitudes, it’s probably there for you, the tourist — to take photos. You’ll see llamas grazing at Machu Picchu, giving you some wonderful photo opportunities. If you stomp your foot on the ground, they will often look up. Watch out if their ears go back, because they might be preparing a mouthful of spit to project at you. Not fun. This is a wall calendar hole punched and with a spiral middle. The photographs are on top with the calendar dates on the bottom. October: Llama train coming across a high peak. Photographer, Tracy Foote‘s photos come from six trips through Peru and Bolivia. Her love for nature and hiking comes from her summers spent as a child in the Adirondack mountains. Growing up on the upper West Side of Manhattan, she treasured escaping away from honking cars into the tranquility of the pine trees. Today, she continues to travel and encourage others to explore and preserve the environment.